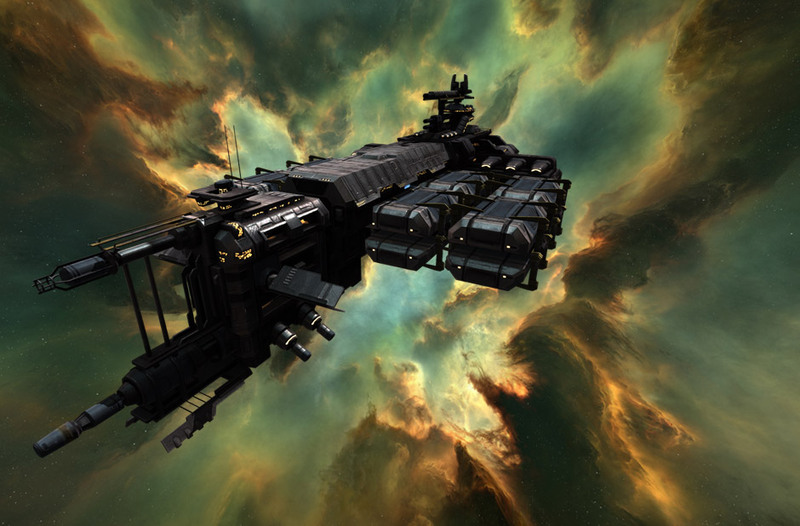 With the removal of POS Structures from New Eden planned within the next year and the first round of new industrial structures just a few months down the road, all of the capabilities of the old systems which run on POS need to be moved into new structures. Currently, one of the most important capabilities is moon mining. No information has been released by CCP on their plans for how to bring this into the new structure mechanics, which makes it high time to begin brainstorming for the future that could be. The current mechanics for moon mining are really simple. It can be broken down in a few super simple steps. 3. Launch Discovery Survey Probe. 4. Wait about five minutes. While you’re waiting, repeat steps 1-3 for the rest of the moons in the system. b) Anchor Moon Mining Array and supporting structures. c) Make dank space ISK. From the standpoint of actual reality, there are a few issues with this system. First, in real life, surveying for mineral deposits isn’t a matter of poking around in the ground. Mining companies spend millions of dollars a year on exploration rigs, which search around the clock to find additional reserves for companies to exploit (Barrick, one of the largest gold companies on Earth, spent $155 million in 2015). Initial exploration projects can take upwards of a year to even say if a site has enough minerals to make further drilling a reasonable expense. It will take further years to decide if the deposit is actually worth mining. It is not uncommon for ten years or more to elapse between the first drilling crew to arrive and when mining actually starts. In EVE, we hit warp, hit align, hit launch, wait a bit, and move on to the next one. The mining process itself is just as simple. On this planet, a big mining operation takes billions of dollars, thousands of people, and decades to mine an entire mineral deposit. Bingham Canyon mine in Utah has been producing copper continuously since 1906 with no plans to cease production in the near future. However, all mines have a hard limit where they are no longer making money and need to shut down due to pit size, depth, and a variety of other issues. Furthermore, a large mine very rarely produces just one thing. Most valuable minerals will form in close proximity to several other valuable minerals. Bingham Canyon primarily produces copper, but also staggering amounts of gold, silver, and molybdenum as byproducts (2014 production at present day prices- Copper: $963m, Byproduct Minerals: $575.9m). In EVE, someone anchors some POS structures, tells the moon miner where to dump a single product, and picks it up every few weeks. I’m not saying this system is necessarily bad, but there is so much more that can be added to it to make it active and involved gameplay for all instead of passive gameplay for the rich and powerful. Based on discussions with those experienced in these matters and my own experiences both ingame and in real life, there are a few options out there to replace the POS based moon mining as the towers are phased out. The surveying system as it is provides a binary answer for the entire moon. It either has moon minerals or it doesn’t, and you know exactly how much there is. Why not change the system up and make it so firing a survey probe at a moon provides what minerals are present, but not where on the moon or how much. The moon minerals already have their rarities figured out, which can be directly ported to how often a mineral will appear and in what quantities. The abundance of different minerals dictates what is produced per cycle. A moon miner produces 100 units per cycle at present. This would translate directly from percent to units per hour. As the miner worked, the rate at which the different metals were harvested would go down and the rate of waste materials will go up (as surface mines delve deeper, the stripping ratio which compares the amount of ore mined to waste removed will increase, making it more costly to mine the deeper you go), meaning that at a certain point the amount of metals harvested per cycle will make it uneconomical to continue mining (unless you gotta get them hot gases), and the cycle begins again. The next improvement is that right now there are only a few moons worth harvesting – R64 and R32, with select R16 moons. All the other lesser moon minerals are not worth harvesting alone, and are only worth mining to be used in reactions – they aren’t ‘money moons’ and are only costs in the production chain. By generating these lesser products as byproducts to production, their availability will go up and the costs required to harvest them will go down. The downside of this is that the big R64 fights would become things of yesterday, so some mechanic would need to be put in place to help people identify what moon minerals are being mined in a system. The simple options are either allow scans to identify what minerals are being extracted by the current surface operations on a moon (Moon Miner, ‘The Example Corporation’: Cadmium x%, Caesium x%, Dysprosium x%, etc), which with the new structures right around the corner shouldn’t be too hard to implement. The new moon mining structures should also be easier (and I hope faster) to put up and take down than POS structures, so tossing one up temporarily to harvest a particularly lucrative scan result anywhere in the galaxy is something I hope will occur and cause some gudfites. This capability would also make the Mobile Siphon Unit a thing of the past. Mobile Siphon Units are consumables. (As stupid as that is on a structure worth 15 million ISK a pop that will, if you are lucky, make a million ISK an hour, which means that it takes over half a day of the POS owner not noticing them in order to make any money. 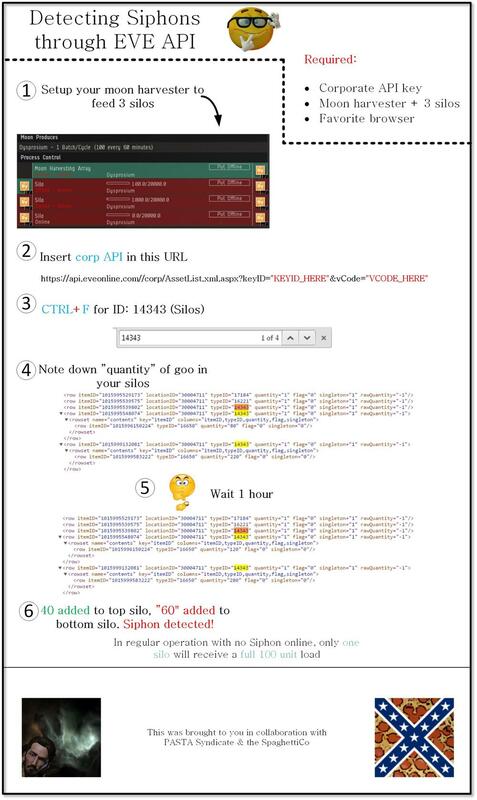 This is especially difficult since detecting the presence of a Siphon Unit on one of your towers can be detected via API meaning the odds of surviving more than an hour is nil.) The moon harvesting structures will probably be big enough to spawn at least a small fight if one is sited somewhere valuable. This method is a bit different from option one, insofar that it requires active participation of pilots. First, remove moon mining as it currently exists completely. Instead, replace the moon mining arrays with the new “Moon Mining Particle Fountain” Industrial Array. This array can be anchored at a moon by anyone with the relevant roles, where when activated, it will begin tractoring up sections of the moon into space as a cloud and/or asteroid field at a set rate. This ‘asteroid cloud’ would contain a number of harvestable items (rocks/clouds) which do not have clear contents (Lunar Asteroid 14712, Lunar Cloud 4311, etc). Each harvestable item can be harvested blindly using either a new module or current gas/rock harvesters, which will put whatever unrefined moongoo it contains in your cargohold, or a module (think targetable Survey Scanner) will provide the contents of the harvestable item in the form of Unrefined Moongoo (already ingame). Currently, moongoo is a top-down source of alliance income – those in charge of the alliance run and manage the POS chains required to harvest and sell the moongoo and then use the ISK to fund the alliance. This method would instead have pilots harvesting the moongoo making the ISK. To get something out of it, the owning alliance can set taxes on anyone who uses the the Particle Fountain to instantly refine the harvested moongoo into its proper simple material form. Corp taxes can be applied at this point as refining in stations used to (the owning corporation would take a percentage of anything refined), and the players would be able to take the rest and do with it what they would (most likely sell it to the highest bidder or the alliance). As the Particle Fountain runs and consumes fuel, it will bring more and more materials up per cycle from the surface until it reaches full capacity (hours of run time). At this point, the cloud won’t get any larger but it will replenish anything that is harvested. When the extraction is done for the day, the Particle Fountain can be turned off, at which point the asteroids and clouds will begin to dissipate and fall back towards the moon (think despawning, but more apocalyptic for anything on the surface). Depending on the amount of stuff in the cloud at the time it turns off, it can take some time for it to dissipate (think hours if the Fountain was at full capacity). What is in the cloud would be determined by two things – first, the contents of the moon (I would still recommend the Survey Probes for finding this out), except instead of returning one or two minerals, it would return a list of minerals present and (possibly) their percent abundance. When the Particle Fountain fires up, the resulting cloud would contain a mix of materials similar to what is found inside the moon proper (get prospecting to find the extremely valuable R32s and R64s). The second thing would be constellation or regional availability and scarcity, which I would again argue fluctuates from region to region so no one set of regions ends up with consistently better goo. All of this would combine to maintain a close semblance of the balance of moongoo currently entering the game. People in corporation can warp directly to the Particle Fountain, while other pilots must scan down the array in order to warp to it. Like the Citadels, my opinion is that the Particle Fountain can be equipped with defenses but must be piloted to use them. Anyone can harvest the clouds from around the array, however only those with the required roles in the corporation/alliance can turn it on. Another alternative to make this a thing is to make the Particle Fountain a module for… the Rorqual! It would act similarly to the industrial module presently does, but instead of doing whatever it does now (I don’t remember, who actually uses Rorquals right now), each five minute cycle would pull up a certain amount of material from the moon to the space surrounding the Rorqual. The contents of the cloud can then be harvested, and the Rorqual can be used as a mobile refinery while its ‘sieged’. Taxes could be taken either in the form of a fee or a percentage of refined goo right there. It would certainly provide a unique and unparalleled role for a ship that hasn’t really served a vital purpose in the last few years. So there we are, two examples that would turn moon mining into a system that is more involved than the current hands-off system. The current system is a bit of a chore (like all industry). Thats not a bad thing, because there are plenty of strange people who enjoy that sort of thing, but current moongoo extraction requires a handful of people in an alliance of many thousand, and its not enticing gameplay. There’s nothing that allows for optimization, and its extremely hard to harass moongoo production chains. The new systems I’ve proposed would allow for greater optimization, new and exciting ways for people to get involved in production and make money off it, and include actual useful ways to harass and steal from those who are running the production chains.